Fixed a bug with “Translate Paths …” with option “Include output paths”. Fixed a bug with relinking asset files with option “Rename File on Hard Drive”. Fixed a minor issue with relinking. Fixes some minor interface issues. Adds ability to set intensity multiplier for rendering of the IES files. Fixes the issue with starting on the x32 system. Fixes some issues with generating the preview for HDR, EXR and PSD files. Fixes a potential issues with translating a paths to local\network. Add the ability to render the preview as .png with alpha channel. Fixed the some issues and bugs when the system use the text with size greater than 100%. Fixed the bug with locking the 3ds max hotkeys after opening some menus. This version is required the new license-key. Please send a request for update from dashboard. Adds support to renderer Octane – working with asset files. Adds support to renderer Octane – rendering previews. Fixes issue with blocking 3ds max hotkeys after opening menu “File”. Fixes issue with setting a default renderer in Batch Render&Relink. Fixes issue with applying render-preset in Batch Render&Relink. Adds ability to reorder Search directories with drag&drop. Adds ability to set Default Renderer for Batch Rendering. Merge materials for xRef Objects. Now you can add Custom Dependencies with drag&drop. Fixes a bug with rendering of 3d models. Fixes a bug with starting the “FilePathFinder PRO” on some computers. 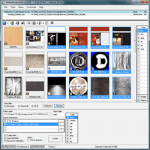 Adds ability to use custom studio for rendering the 3d models and materials. Fixes a issue with flipping thumbnails for max and video files. Some changes for Preferences dialog. The new improved system of search for asset files. Fixes some minor issues for batch render. 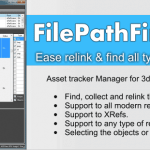 Adds support to 3ds Max 2012. Adds ability to render thumbnails for 3ds, fbx, obj, vrmesh(Vray Proxy), mib(Mental Ray Proxy) files. Some changes for Dark theme interface. Fixes issues with memory leaking with render thumbnails. Fixes issues with loading render-preset files for render thumbnails. Fixes issues with autosearching asset files for render thumbnails. Now a batch render and search , collect and relink the files in batch mode is done via the utility “Batch Render&Relink”. Fixes a bug with render thumbnails for 3ds max 2010&2011. 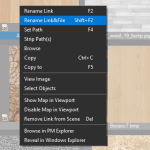 Fixes a bug for 3ds max 2011 when working with Slate Material Editor. Increase speed of loading thumbnails. Fixes issues with relinking V-Ray environment maps. Fixes issue occurs on some computers when running utility. The Utility “Render Thumbnail” is Updated. Adds the ability to render all materials and textures in the Material Library. Adds the ability to specify size for thumbnails rendering. Adds the ability to use for models rendering the renderer settings from the scene. Adds the ability to use for models rendering active viewport. Adds the ability to specify custom view for models rendering . Fixes the issues for auto detection compatible render-preset for Models Materials and Material Libraries. Now with the utility supplied three render-presets(For Scanline, Mental Ray and Vray), but if you use a different renderer, you can add your own render-preset. Fixes issues with cancel dialog for 3ds Max 2011 when run collect asset files. Fixed issues with cancelling Collect Files operation. Removes some restrictions from the demo version. Fixes issues with the updating of external files when adding xRef and when “Refresh at Start” is off. Adds ability to work with unsaved max file. Correction for copying the animated MentalRay Proxy files. Now preview are copied together with MentalRay Proxy files. FilePathFinder settings are now saved when installing new versions. By default «Deep Relink» function is off. Use «Deep relink» function only if the standard method of the path to your files not relinking. This method is somewhat slower. If you still have to use «Deep relink» function, please create and send the developer a report about your problem. Fixes a finding of textures and a select of objects on textures containing in objects. Related to "FilePathFinder PRO Update History"